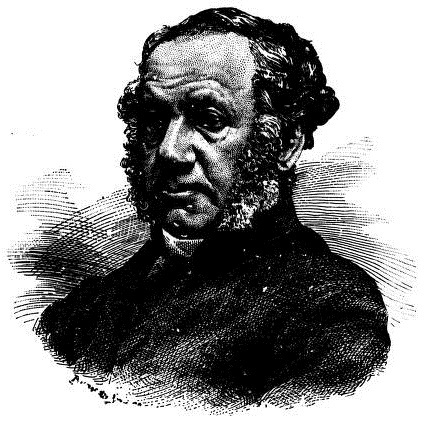 Alexander Davidson was one of the key figures in the early development of the typewriter, yet very little is known about him. One claim has it that Davidson was responsible for the QWERTY keyboard configuration, but as Davidson did not become involved in the Sholes & Glidden/Remington 1 project until 1875, that is highly unlikely. Nonetheless Davidson’s name crops up in most typewriter histories, but these are passing references in regard to the Sholes & Glidden, the early Remingtons and the Yōst. The Yōst may have started out with a George Washington Newton Yōst concept, but its realisation, and certainly that of the New Yōst, had a lot more to with Davidson, Andrew Winton Steiger and Jacob Felbel than Yōst himself. Davidson also worked with the typewriter inventor and manufacturer Halbert Edwin Payne (born Titusville, Pennsylvania, 1867), who in turn had typewriter dealings with Lee Spear Burridge and Newman R.Marshman. One will find claims that Davidson was born in Scotland in 1832. In fact he was American-born, though a descendant of an Alexander Davidson who arrived in America from Scotland in 1700.
making appliances for illustrating the studies he pursued. 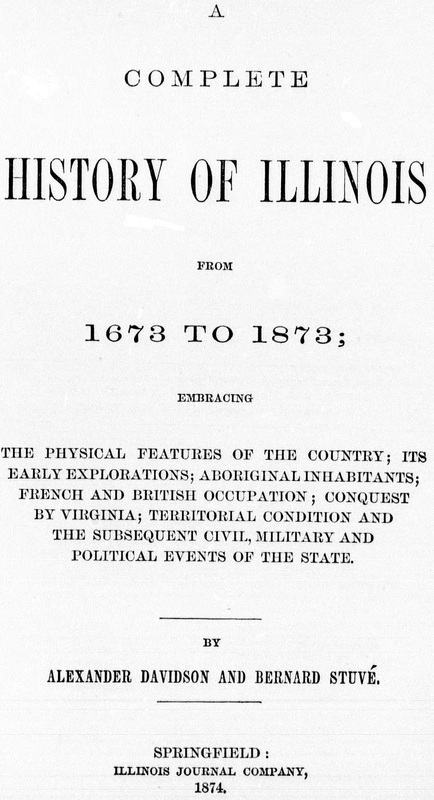 In 1864 Davidson formed an alliance with W. D. Rutledge of Springfield, Illinois, in the management of a commercial school. Their offices were fitted up with desks representing cities and these were connected by a miniature electric railway system, with miniature freight for transportation. This method of teaching became at once popular and increased the patronage of the school. 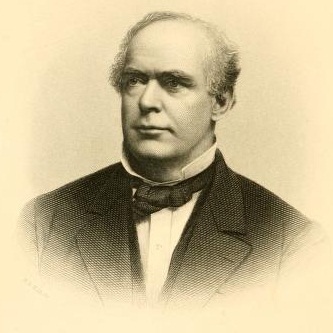 But Davidson disposed of his interest in this school in 1869 and entered the United States Revenue Service, later devoting much of his time to farming in Springfield, Massachusetts. 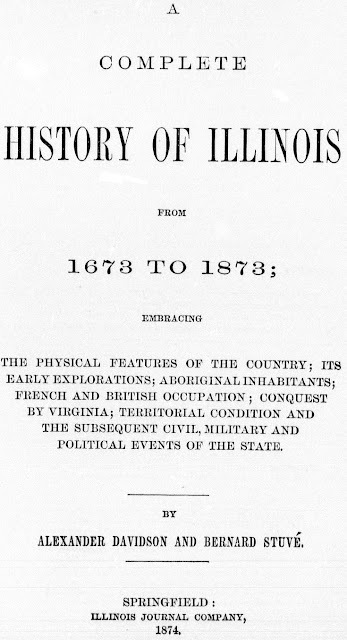 In 1874 he and Bernard Stuvé wrote A Complete History of Illinois, an edition of which was published for use in schools. 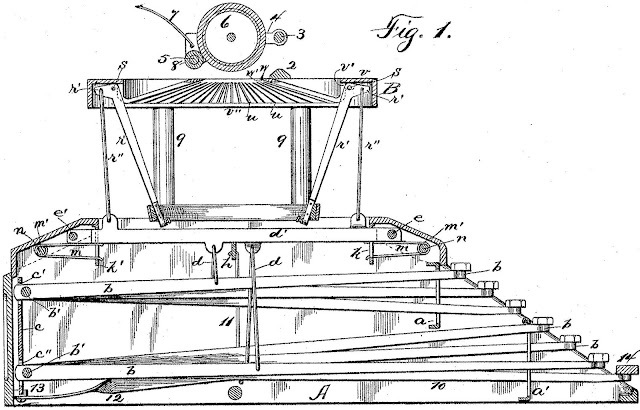 Davidson also continued his inventing, which included a paddlewheel patented in 1881. Davidson saw the Sholes & Glidden/Remington 1 for the first time in 1875 and was among those employed to help make improvements to the machine. 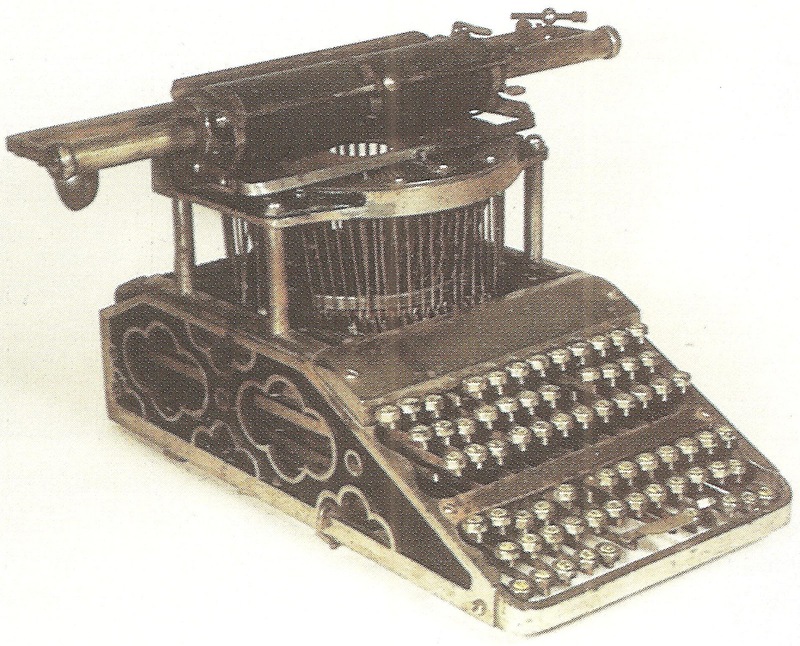 He also made important additions and improvements to the Densmore and the early Yōst typewriters. 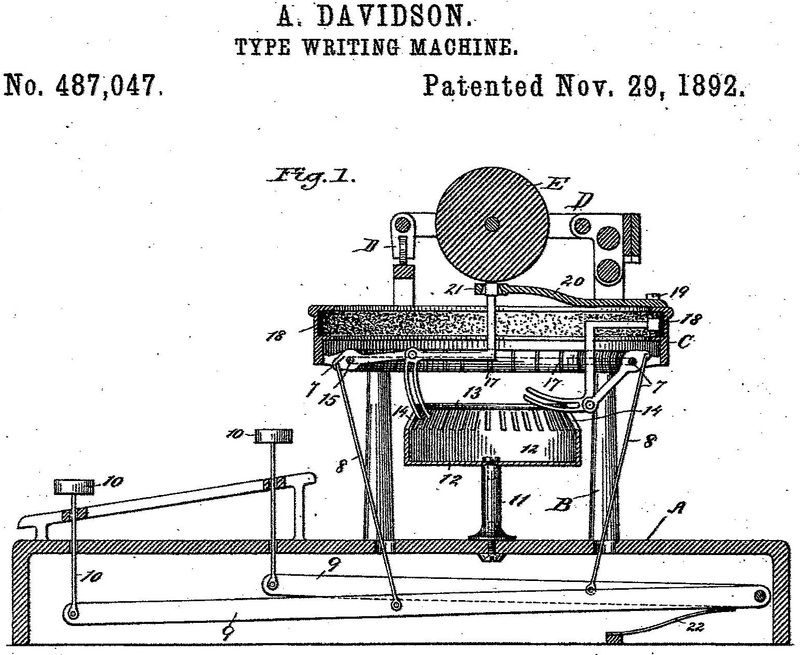 It is alleged that in 1887 Davidson sold typewriter patents to the American Writing-Machine Company for a design which became the Yōst. What is certain is that on this day (November 29) in 1892, Davidson was issued with a patent for an 1888 design for the New Yōst, which he assigned to the Yōst Writing Machine Company of New York. Davidson died at Fort Wayne, Indiana, on October 12, 1893. Lucien Stephen Crandall found that he was a hard act to follow. After the glorious Crandall typewriter, with its mother-of-pearl inlay, gold filigreed pinstripes and painted flowers, he struggled to put in a repeat performance of such stunning proportions. In the late 1880s, however, he found a potential manufacturer for a completely new typewriter: one William Avery Sweet - a flashy, wealthy and highly successful Syracuse businessman with diamonds set in his teeth. 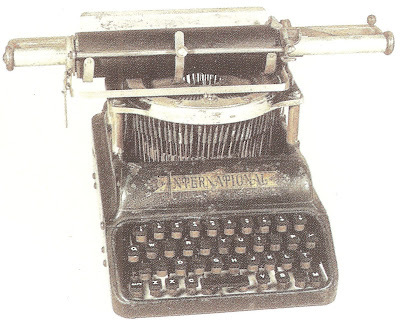 The typewriter was the International. Flavio Mantelli covered the various versions of this machine in an article in ETCetera No 94, in June last year. In it, Flavio wrote, “…the actual patents for the International were not granted until 1893, with four patents issued on [this day] November 28." What wasn’t mentioned is that these four, plus two others, issued in the following two years, were all assigned to William A. Sweet. These were six of the last seven typewriter patents taken out by Crandall – he had 11 altogether, dating back to 1875. Sounds great, but in reality the International failed to match the impact of the Crandall. Thus it came to be that in 1900, Crandall was still dining out in his efforts of a quarter of a century earlier. "I am the man who invented the typewriter girl." “The world has a great deal to thank me for,” Crandall retorted. The meeting at the Astor House revealed that the first of the family to arrive in America was John Crandall, who sailed into Boston Harbour in 1634. He was the first Seventh Day Adventist on the continent. One lllustrious Crandall, Joseph, founded Utica in 1701. Benjamin P. Crandall, first of the family in New York City, invented the baby carriage. 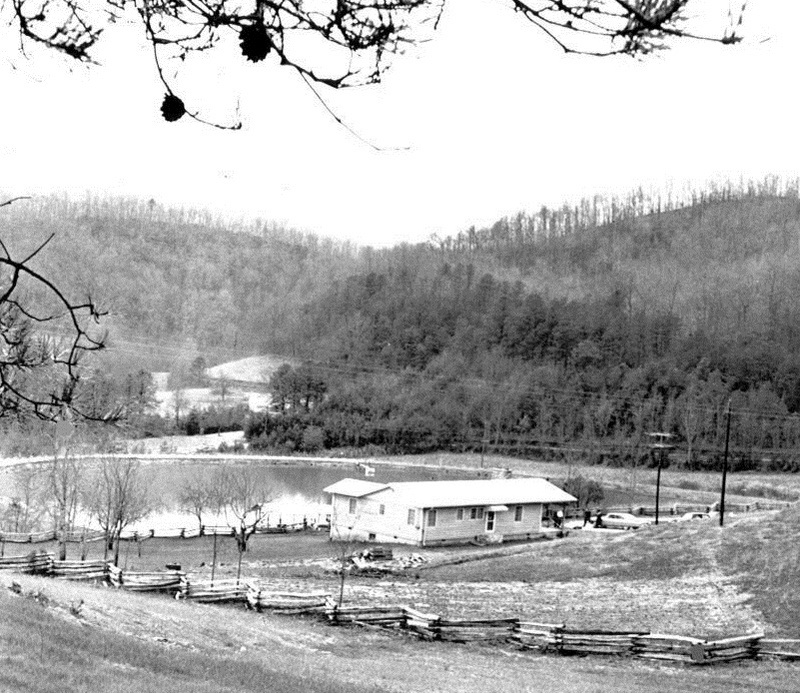 Homer, John and William Sweet were well known brothers of Pompey Hill. Homer Sweet was a poet and surveyor. John Edison Sweet was an engineer, a professor at Cornell University and a dean at Syracuse University. 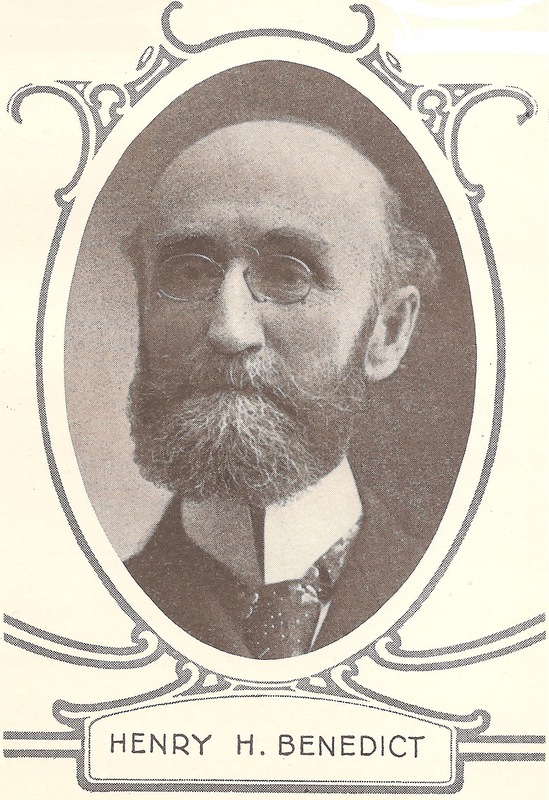 William Sweet refined some of the steel manufacturing techniques of the day and in 1890 manufactured $740,000 worth of steel at his company in Syracuse. 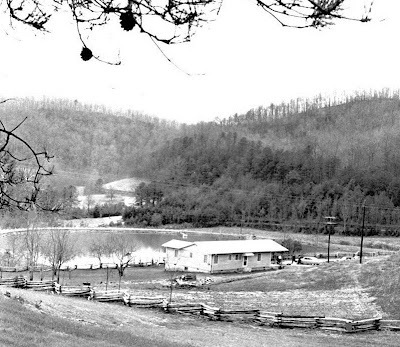 William Avery Sweet was born on October 12, 1830, in Pompey. 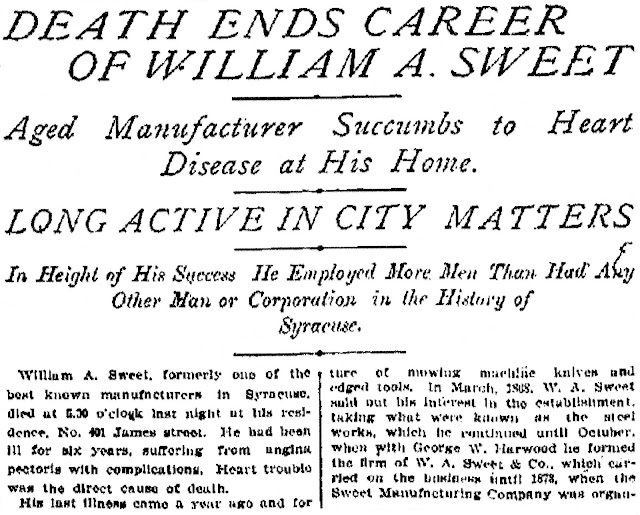 He died in Syracuse on January 30, 1904. 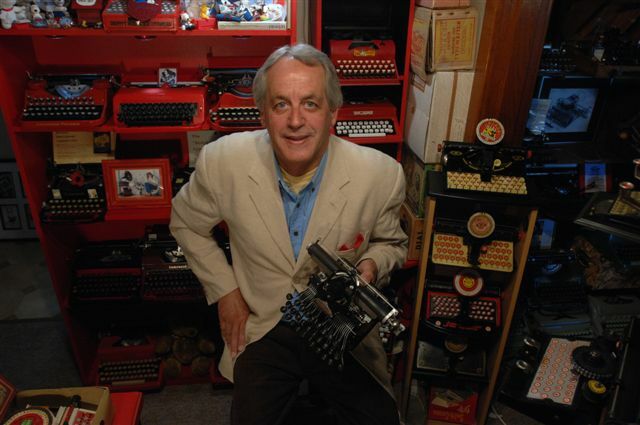 When Joseph Peter Barkdoll sat down in 1957 to design the world’s first electric portable typewriter, the Smith-Corona 5TE, he felt no need to change the basic mechanism of the Corona. 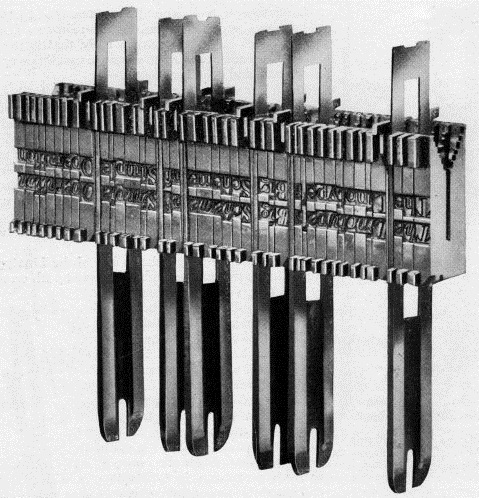 Yes, 25 years after Henry Allen Avery had re-designed the Corona four-bank, creating the Clipper-Sterling-Silent series, his work was still good enough for Barkdoll. “Al” Avery had been issued with his patent on this day (November 27) in 1934, but had applied for it in January 1932. By a weird coincidence, on this day in 1936, one Harold T.Avery, of Oakland, California, applied for a patent for an electric control device for a Marchant calculating machine. 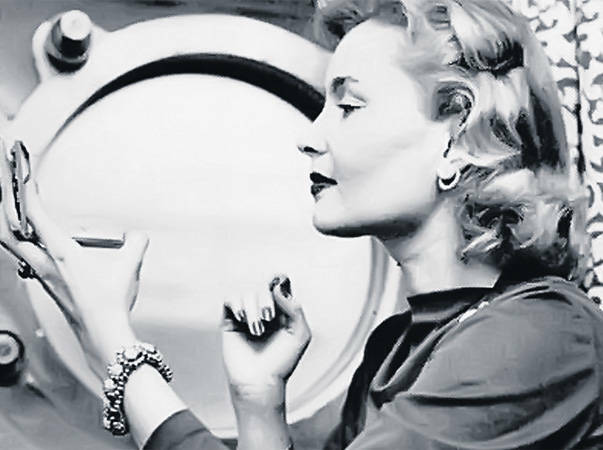 One year after the Smith-Corona 5TE emerged in 1957, Marchant became part of the same stable. Samuel Irving Berger designed many eye-catching toys and toy typewriters, perhaps most notably for Louis Marx in the early 1930s. 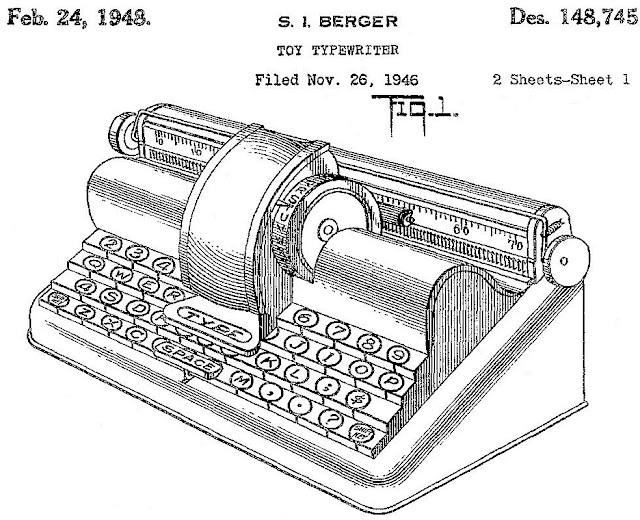 But among my favourites is this one, the Unique Portable typewriter, for which Berger applied for an independent design patent on this day (November 26) in 1946. Berger was born to Russian parents in Newark, New Jersey, on August 9, 1889, and started out working in his father's tailor shop. He died in 1970, aged 81. He designed toy typewriters on commission for Marx and Mettoy (and Mettype) as well as his own companies, Berwin and Unique. Berger and Marx had a falling out in the late 1940s, over competing toy train designs. 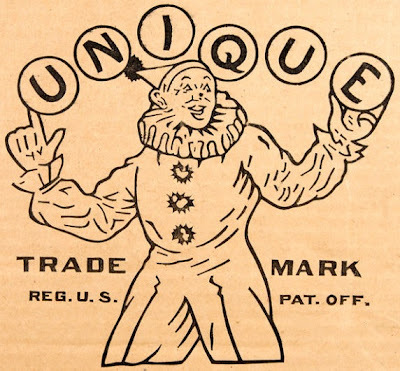 The two had previously cooperated, with Marx providing tooling to Unique and sometimes acting as a distributor for Unique's products. In 1949, Unique began producing lithographed tin O-gauge toy trains, using tooling of its own design along with some recycled tooling from the defunct Dorfan Company. Unique sold its trains in inexpensive boxed sets like Marx. Louis Marx saw this as a betrayal and responded with a new line similar in size to Unique's, but with lithography that looked more realistic. Unique found itself unable to compete, and had withdrawn its trains from the market by 1951. 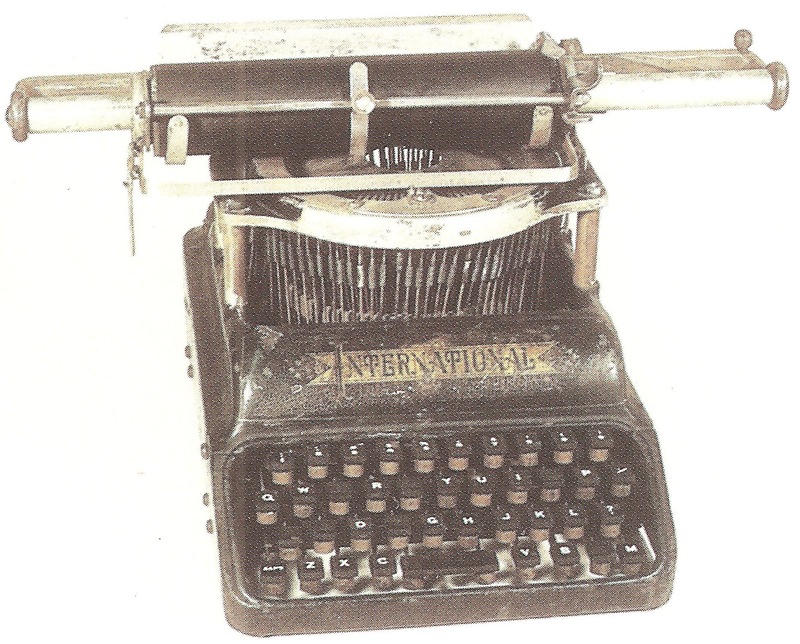 Marx also moved production of toy typewriters to Japan in order to undercut Unique's price. Still, Sammy had done well enough by 1940 to be able to afford Caldwell Timberlake as a butler and Edna Goss as a maid. 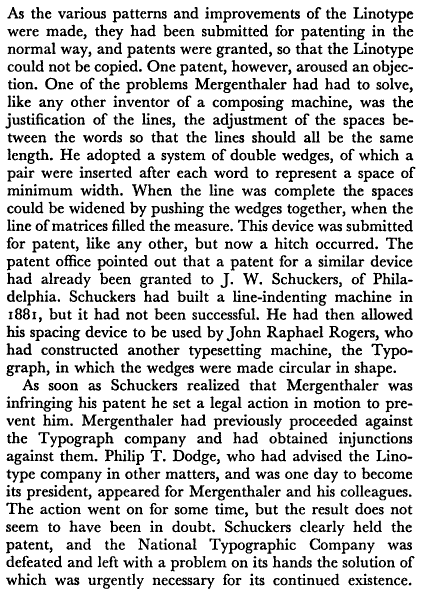 Jacobs William Schuckers’ place in type setting history is secure, with his invention of the double-wedge spaceband line justification method which made the Mergenthaler Linotype machine what it was. 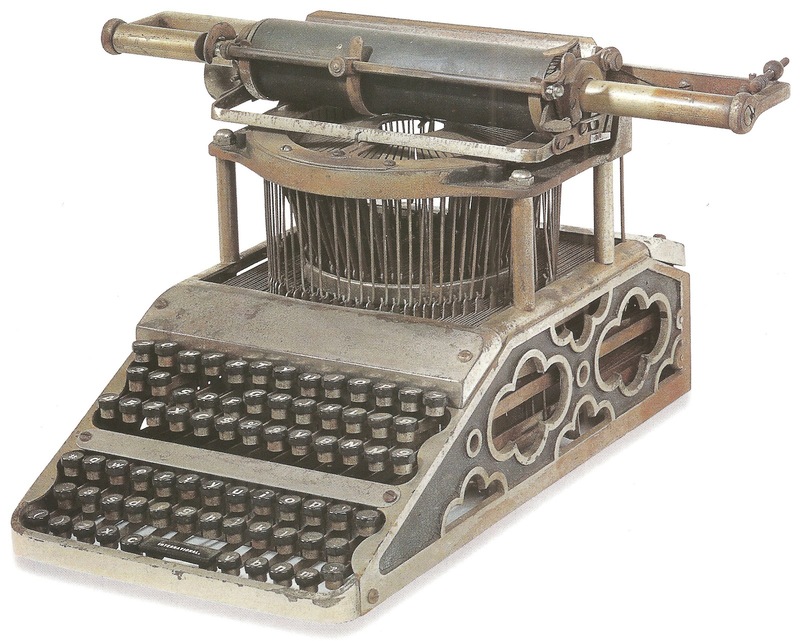 Much less known is that Schuckers invented at least one if not two typewriters which went into production. 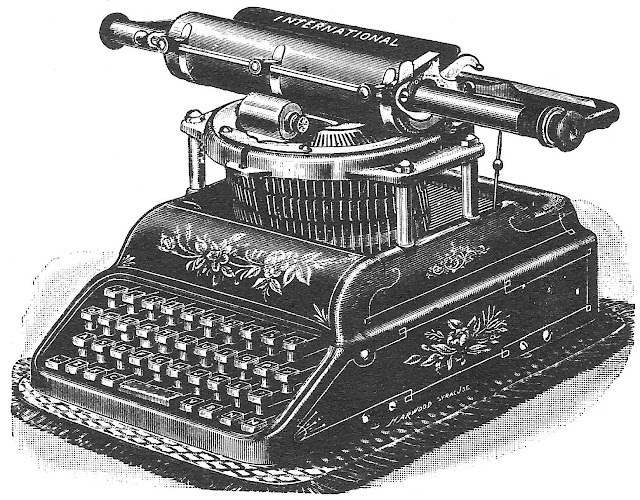 We do know his Essex typewriter, for which Schuckers was issued with three patents on this day (November 25) in 1890, was made. Mares says it was a low-priced typewheel machine “which existed but a very short time”. 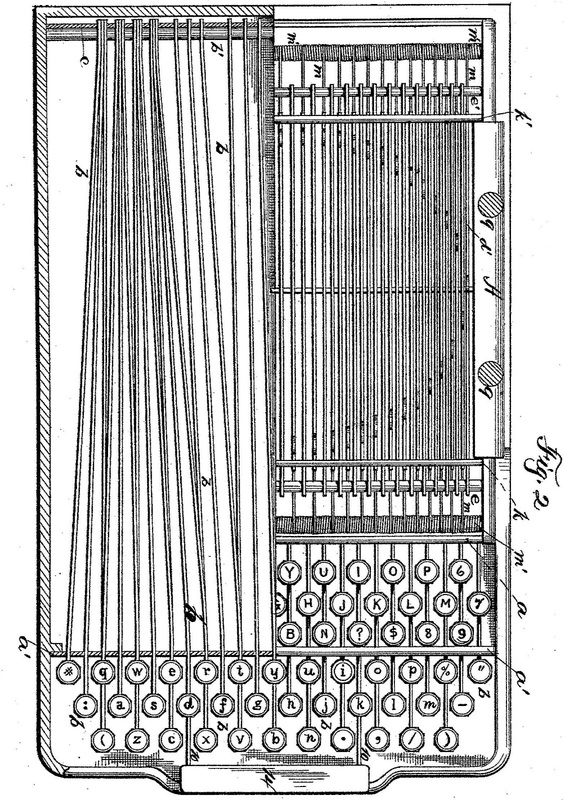 The first of Schuckers’ eight typewriter patents, applied for between 1886 (when he was still living in Philadelphia) and 1904, was unassigned and it was for a swinging sector machine. Michael Adler claims the Essex Universal Typewriter Company of New York produced just such a machine in 1890, “but with limited success”. Schuckers’ next four designs were all for typewheel typewriters. The first of these was applied for in 1889, by which time Schuckers had moved to Newark. It was assigned to the Clyde Type Writer Company of West Virginia. 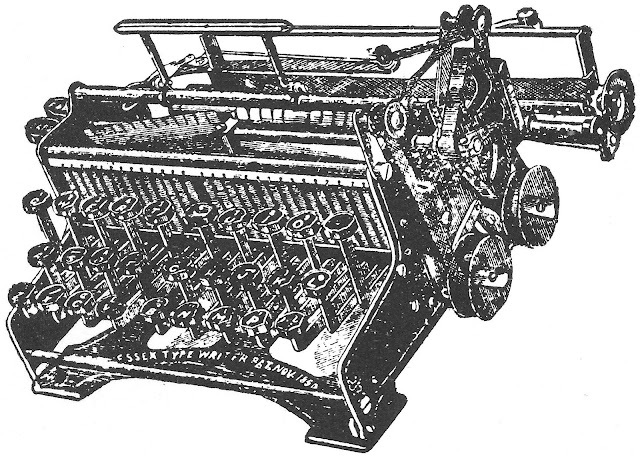 Schuckers’ following three designs came later that same year and were assigned to the Essex Typewriter Company, also of West Virginia. His final three designs, between 1890-1901, were all unassigned and were also all for typewheel machines. 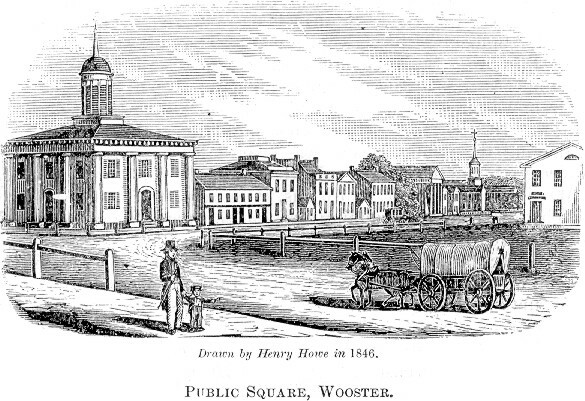 Schuckers was born in Wooster, Ohio, in 1831 and left school at 15 to work in the composing room of the Wooster Republican. 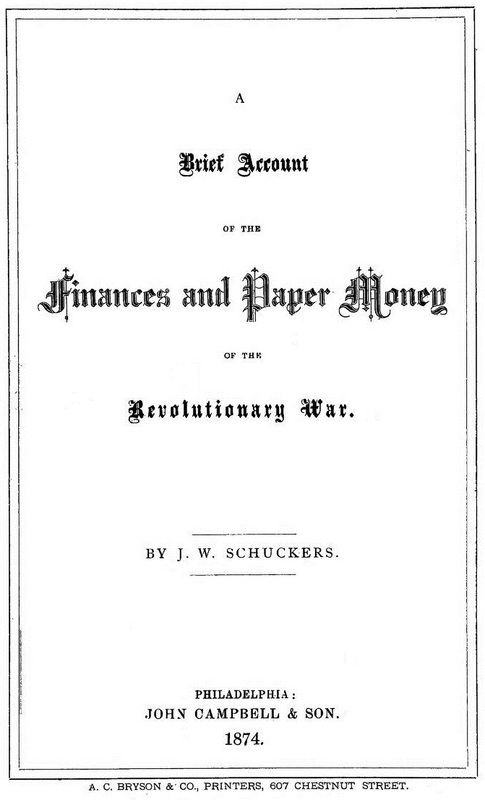 After some years in newspaper work, primarily in composing and printing, Schuckers became the private secretary of Ohio senator and governor Salmon Portland Chase, Treasury Secretary under Abraham Lincoln and a US Chief Justice. 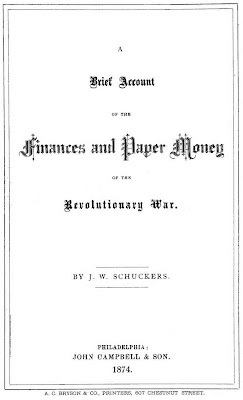 Schuckers wrote Chase’s biography, as well as A Brief Account of the Finances and Paper Money of the Revolutionary War (1874). He also gave a notable address titled The Currency Conflict in 1877. Chase (1808-1873) was one of the most prominent members of the new Republican Party before becoming Chief Justice. He articulated the "slave power conspiracy" thesis well before Lincoln, devoting his energies to the destruction of what he considered the Slave Power – the conspiracy of Southern slave owners to seize control of the federal government and block the progress of liberty. He coined the slogan of the Free Soil Party, "Free Soil, Free Labor, Free Men". 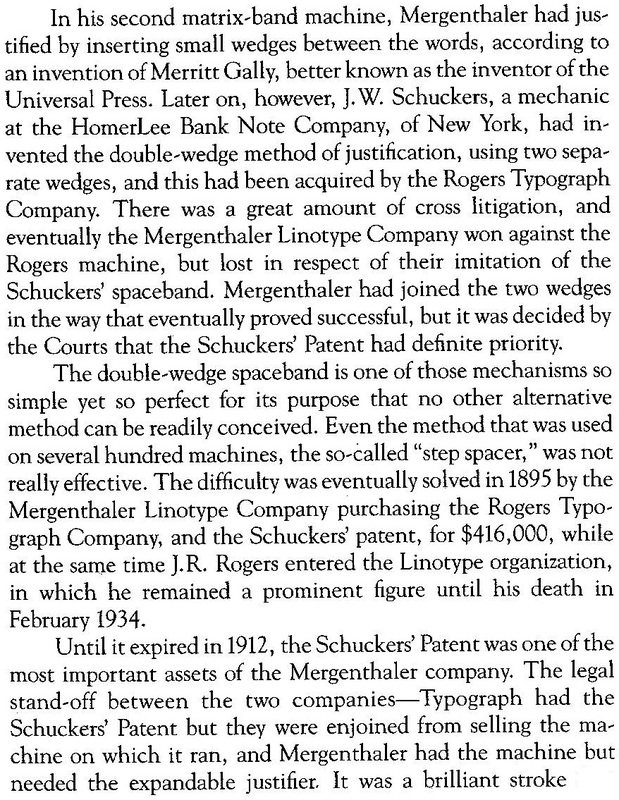 Meanwhile, Schuckers’ most notable achievement was the spaceband method of justifying typeset lines. 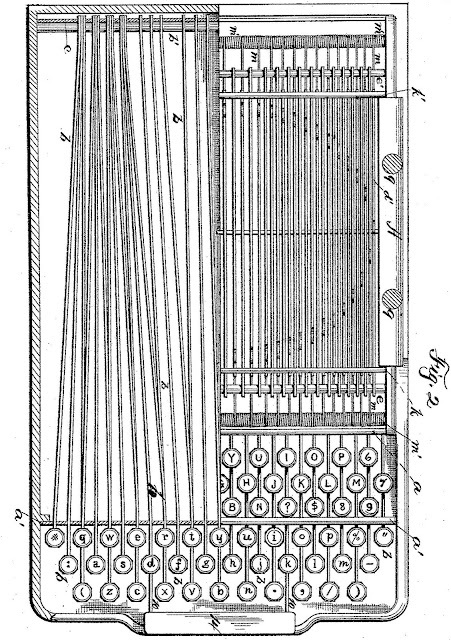 John Raphael Rogers (1856-1934) begun experiments in 1881 to space lines of type mechanically and in 1888 patented a machine to make stereotype matrices. He founded the Rogers Typograph Company in Cleveland and devised a form of the double-wedge spaceband, but came into competition with the Ottmar Mergenthaler Linotype. In a suit against Rogers, Mergenthaler (1854-1899) obtained an injunction. This became a three-cornered interference suit involving Schuckers, whose patent application had been bought by Rogers. 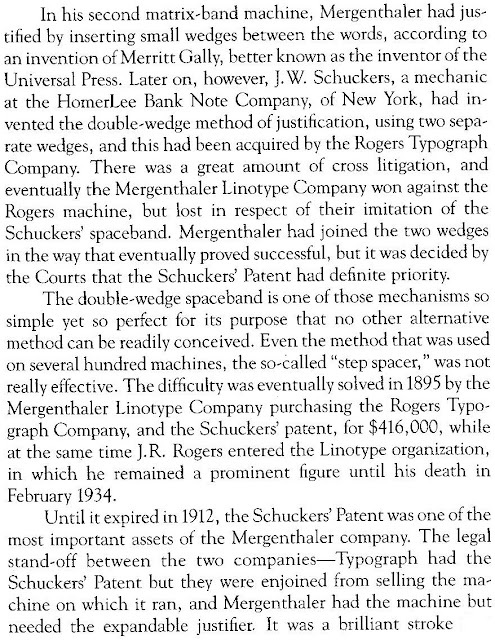 After some years of litigation, credit for the broad principle of the double-wedge was awarded to Schuckers and the right to use it became the property of the Rogers Typograph Company. The Mergenthaler company finally bought all the assets of the Rogers company, and in July 1895 the two were consolidated. Rogers joined Mergenthaler as consulting engineer and chief of its experimental department. 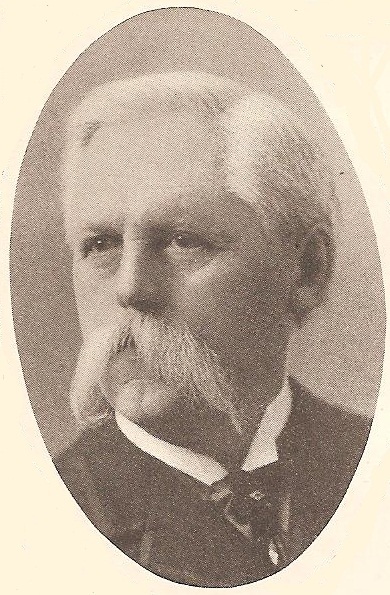 Schuckers died in Buffalo on November 23, 1901, aged 69. He was buried in Washington. 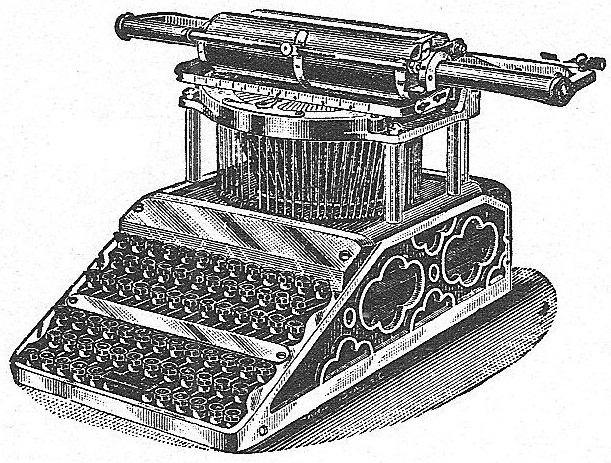 He had worked on the Essex typewriter with Martin Oscar Rehfuss (1858-1940), another mechanical engineer and inventor. 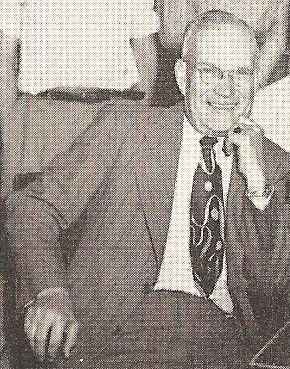 Rehfuss was the son of George Rehfuss, founder of the American Buttonhole Sewing machine Company. When typewriter heiress Gambi Benedict broke the law and eloped with a still wedded Romanian chauffeur in early 1960, she drew the focus of the world’s Press on her family’s vicious squabbling over the inheritance of Remington typewriter pioneer Henry Harper Benedict. What was dubbed the “Remington typewriter fortune” was variously estimated at being worth between $50 million and $90 million. 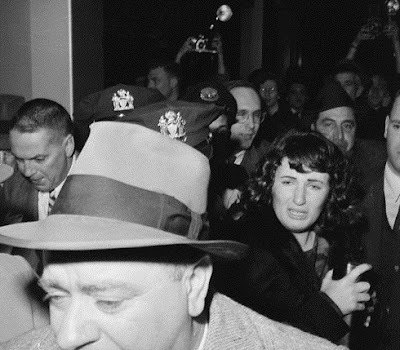 As reporters and photographers clambered outside the Benedict town house at No 5, East 75th Street, Manhattan (“the size of a small Swiss hotel”) waiting for a glimpse of Gambi and her grandmother – Henry Benedict’s widow - members of the Benedict family and other bit players in this long-running real-life soap opera queued outside New York’s courts waiting for their turn to throw vitriolic accusations at one another. It was on for the very young and the very old, all in no uncertain fashion. The legal combat took a deadly toll, with Henry’s widow and one of his daughters dying from the stress of it all at the height of this drawn-out imbroglio. 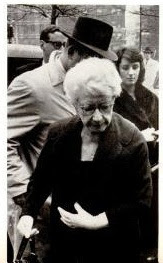 Both Gambi and Henry’s daughter by his first marriage, Helen Elizabeth Benedict Forrest, took the stand to accuse Gambi’s grandmother, Katharine Geddes Benedict, of concealing their share of the Benedict millions. Katharine, as it turned out, had squirrelled the mullah away all right – in toilet cisterns and kitchen drains, among other unsavoury places. Gambi also charged her “Grammie” with illegal confinement, while “Grammie” was sued by the Romanian chauffeur and his legal wife for much the same thing. The bottom line for many of these court actions seemed consistently to be: hand over $1 million, thanks Gram, and be quick about it. The Gambi Benedict affair was the stuff of dreams for newspaper and magazine editors and television producers, right across the globe. These seemingly endless, increasingly lurid stories, about a lovestruck, naïve girl called Gamble, were a sure bet to make page one anywhere on earth. They were, after all, based squarely on the wages of the cardinal sins: avarice, lust, envy, wrath and vainglory. They were about wagers against disinheritance, risks of being caught gambolling about in an illicit affair with an older married man, or hiding away millions in inheritance money that rightfully belonged to others. Readers and viewers loved it, and lapped up every syllable. Here was the archetypal “poor little rich girl”, trapped in a “gilded cage” in Manhattan by an ogre of a grandmother and made a ward of the court to stop her seeing her chauffeur in a shiny refugee’s suit. Fairytales are made of lesser raw material. The story had all the trappings of a major, memorable melodrama. 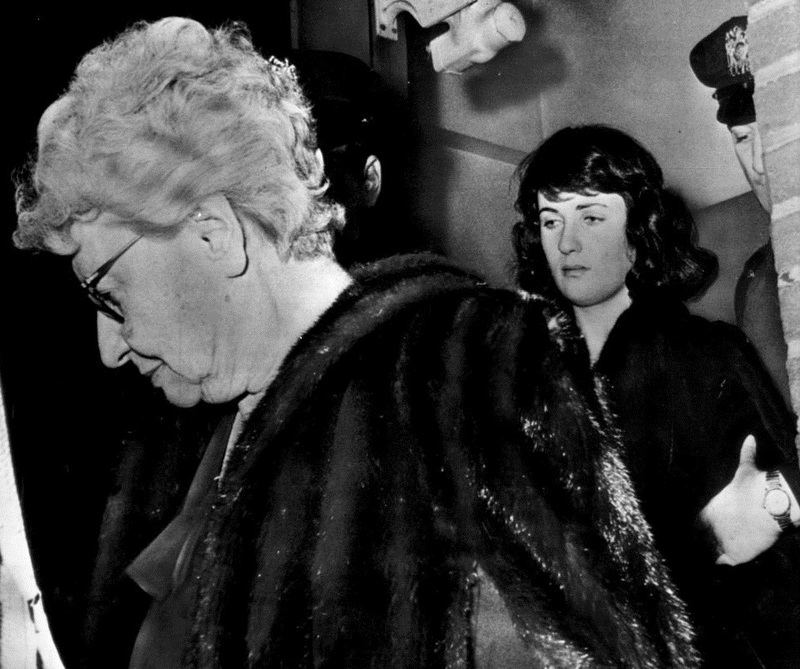 When Henry’s second wife, the evil “Grammie”, otherwise known as Katharine Geddes Benedict, suddenly dropped dead at the peak of the scandal, US Tax investigators found millions in cash and jewels stashed away under her bed mattress, in her kitchen drains, her toilet cistern and in bedroom closets. Those awful, wayward kids weren’t going to get their greedy hands of “Grammie’s” money, no way! LIFE magazine went hot and heavy on the Gambi story, running her on its front cover in full colour and devoting many pages to three seriously slanted major features on her antics. One disgruntled female reader wrote, “Can it be that all the world's problems are solved at last? LIFE must think so if the most prominent news story it can find is the Gamble Benedict frivolity.” Ouch! While Andrei puts his feet up, Gambi does some housework. Apparently she also had to mend and iron her own clothes. Some American columnists tried to sound sympathetic towards Gambi. After all, they wrote, being filthy rich and having servants wait hand on foot on you isn’t all fun and skittles. There are responsibilities attached to having this sort of dough. What’s more, Gambi had just turned five by a month when her mother, Josephine Catharine Benedict Sharpe, Henry’s daughter by Katharine Geddes Benedict and the wife of a Vermont psychiatrist, swallowed 50 sleeping pills in her New York apartment one night in February 1946 and died. No wonder Gambi was a somewhat troubled little lass. Did I say this would make movie material? And there’s even a sweet, innocent young orphaned Gambi in it! Where did Gamble get her unusual (at least for a girl) name? 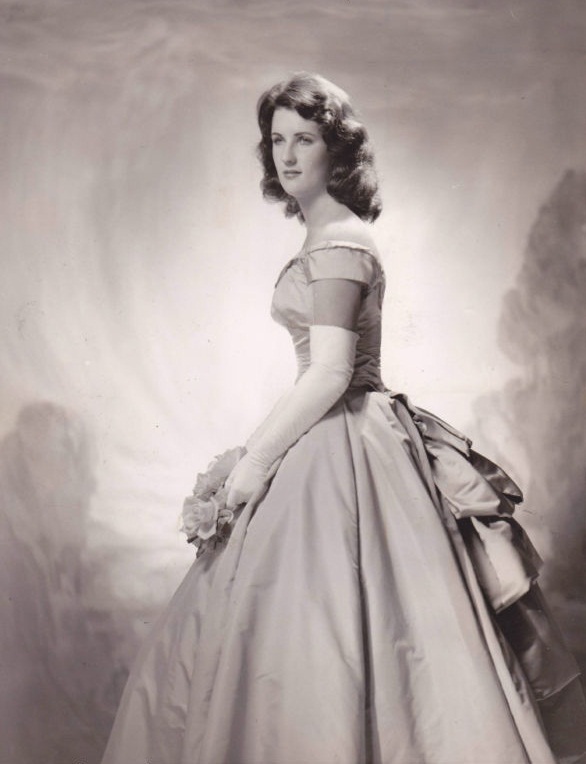 Her grandmother, Katharine Geddes Benedict, was the grand-daughter of the Very Reverend Dean John Gamble Geddes, of Hamilton, Ontario, who was the son of Sarah Hannah Boies Gamble, the daughter of John Gamble. John Gamble was born in Enniskillen, Ireland, in 1755, the eldest son of William Gamble of Duross. John was a surgeon in the Queens Rangers who arrived in New Brunswick in 1783 and settled in St John and Maugerville, Sunbury. He moved to Ontario in 1798. Sarah Hannah Boies Gamble was born in Maugerville on April 6, 1788. For typewriter historians, the really interesting aspect of this saga is that it occurred at the very time when Remington, by then part of the Sperry Rand Corporation and about to move production from Glasgow to Holland to avoid labour troubles and mounting costs, was struggling to keep its head above water. And here were the Benedicts at one another’s throats over $50 million! Where was the justice? In all fairness, it would seem Henry H. Benedict’s massive fortune was accumulated not so much through his Remington typewriter manufacturing and sales ventures as from his astute investments in art: in the works of James McNeill Whistler in particular. Ironically, when all the dust had just about settled on the Gambi Benedict affair, Gambi married and settled down with a square-jawed New York cop, Thomas F.Gallagher. Ironic, because Gallagher in the 1970s posed in a sting operation as bent cop “Tom Gordon” and proceeded to recover from crooked art dealers $2.5 million worth of art works, including a Rembrandt, which had been stolen from the Eastman Collection in Rochester and had found its way to Montreal. Let’s start at the beginning, with Henry Harper Benedict. 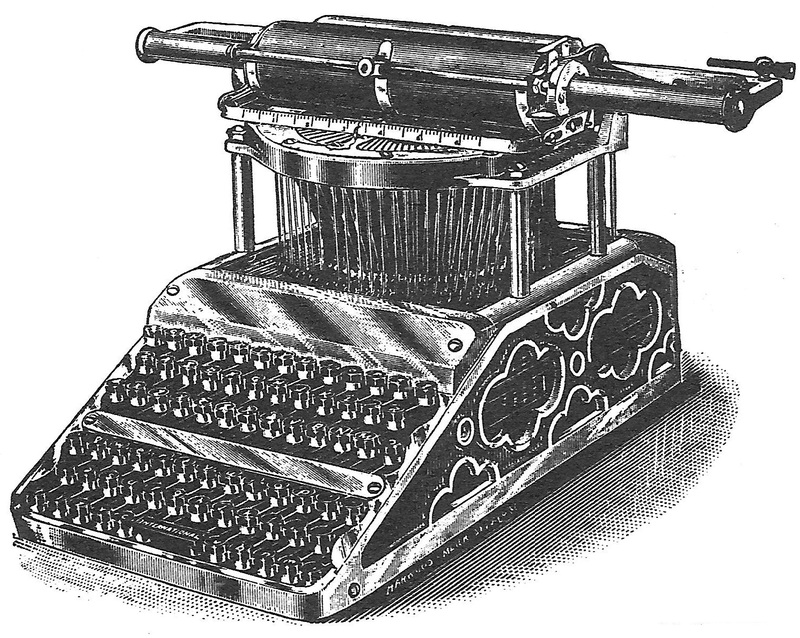 After all, the Remington typewriter (as opposed to the typewriter) story starts with Henry H. It was Henry who in February 1873 gave the word which convinced Philo Remington to commit E.Remington & Sons of Ilion, New York, to make the Sholes & Glidden. 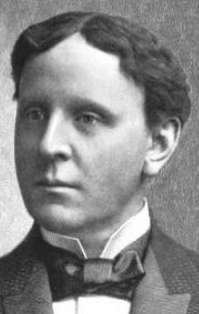 Henry Harper Benedict was born at German Flats, Herkimer County, New York, on October 9, 1844, and educated at local public schools, the Little Falls Academy, Fairfield Seminary, Marshall Institute at Easton, and finally Hamilton College, Clinton. He entered Hamilton in 1865 and graduated with a bachelor of arts degree in 1869. In 1923 he was also made a master of arts and a doctor of law. Apart being the master of picking winners in typewriters, he was also a master of the art of investing his Remington earnings. In later life, he was described as a banker. Benedict first married Maria Nellis (born Freys Bush, New York, March 7, 1840), the granddaughter of General George H. Nellis, on October 10, 1867. She was 27, he was 23 and a day. On October 11, 1879, a day after their 12th wedding anniversary, Henry and Maria had a daughter, Helen Elizabeth Benedict. 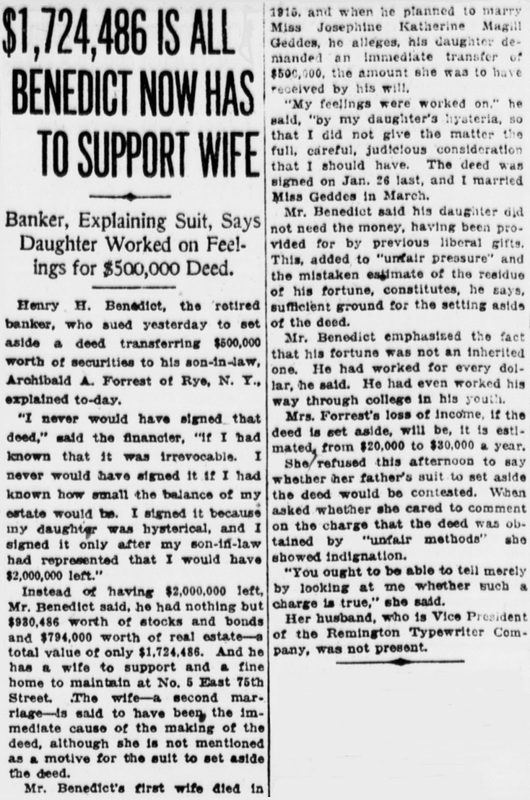 Exactly 81½ years later, this same daughter, as Helen Benedict Forrest, would add considerably to Katharine Geddes Benedict’s woes, by emerging from obscurity to sue for her share of her late father’s millions. 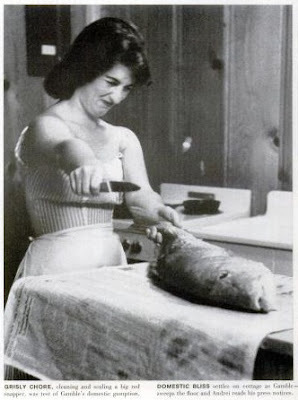 Helen was “spurred” to do so, she said, by the publicity surrounding Gambi’s shenanigans. 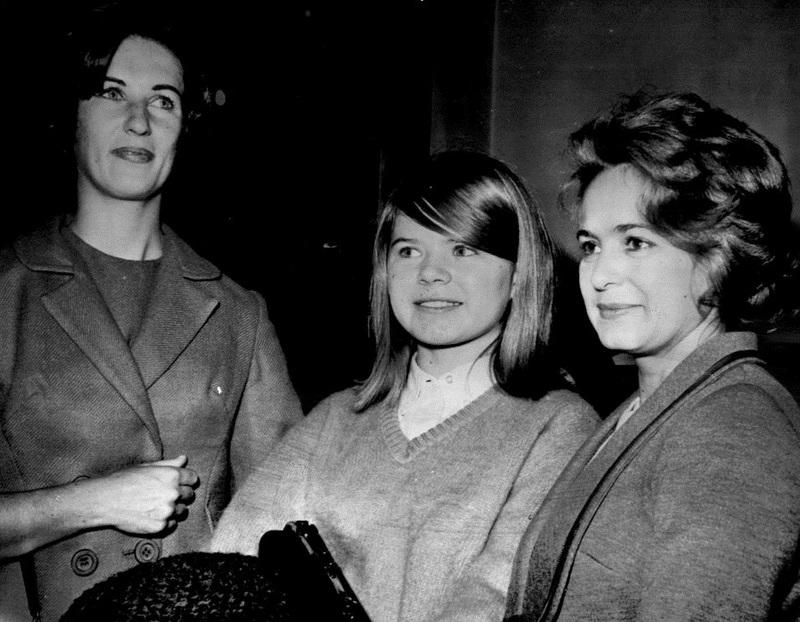 Helen declared herself a step-aunt of Gambi, and said Katharine, though four years her junior, was her stepmother. Helen had married Archibald Alexander Forrest, a real estate agent for whom a generous father-in-law had nepotistically found positions in the Union and Remington typewriter companies, as a director and vice-president of both, no less. 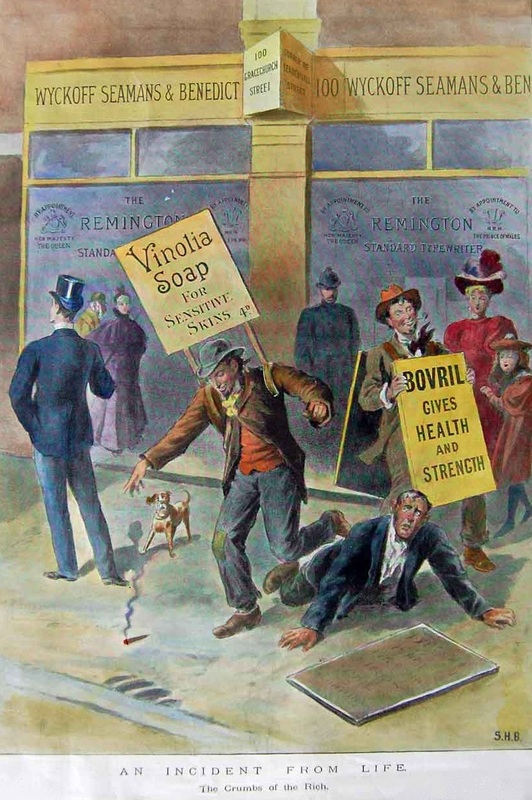 "The Crumbs of the Rich"
Immediately after graduating from Hamilton College, in 1869 Henry Benedict joined E. Remington & Sons as a bookkeeper and rose through the ranks to become Philo Remington’s private secretary and treasurer of the Remington company’s sewing machine division. In 1882 he joined Clarence Walker Seamans and William Ozum Wyckoff to form Wyckoff, Seamans & Benedict to make and market Remington typewriters. Benedict became president of Wyckoff, Seamans & Benedict from 1895 and was also president of the Remington Typewriter Company from 1902 until retiring a wealthy 68-year-old in 1913. He was a trustee of Hamilton College, the Brooklyn Institute of Arts and Sciences, the American Scenic and Historic Preservation Society and the National Institute of Social Sciences. Maria Nellis Benedict died on August 25, 1915, aged 75, leaving Henry a 70-year-old widower. 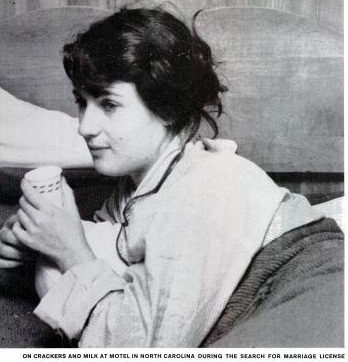 At that time, Canadian-born Josephine Katharine Magill Geddes (born Hamilton, Ontario, 1885), who had arrived in the US in 1905, had been listed as a servant in the Benedict household for at least five years. 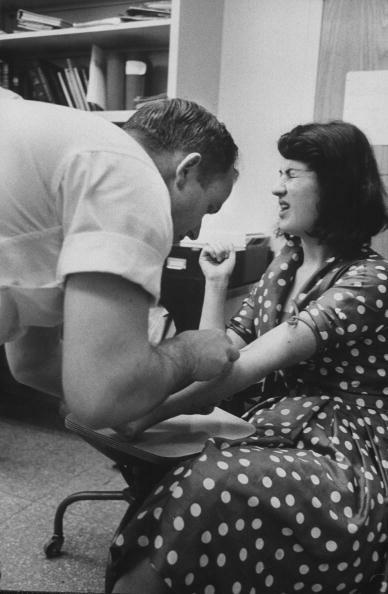 In 1961 it was claimed Geddes was a nurse who had “attended” to Henry H. Benedict through an illness in 1917. Within 10 years, Mrs Geddes Benedict was in control of Henry’s finances, taking action against Goodyear as a major stockholder. Henry Harper Benedict died, aged 90, on June 12, 1935, leaving his widow Katharine – and presumably his daughters Helen and Josephine, too – exceedingly wealthy woman, no more so than, if not exclusively, through Henry's massive art collection. Henry started building the collection while travelling overseas as the head of Remington’s international operations. In 1901 he acquired the only known work to have been sold in Whistler’s lifetime (two years before Whistler died), the watercolour Off the Brittany Coast. In quick time Henry amassed a distinctive collection of Whistler etchings and small works (drawings, pastels and watercolours). 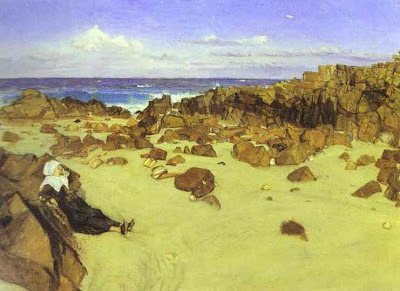 He was generous on lending them to, for instance, the Whistler Memorial Exhibition in Boston in 1904. Henry’s collection of engravings and etchings by the great masters grew into one of the world’s largest and most impressive, and he added to it oil paintings by contemporary American artists. A Turner impression finished up in the Tate. He owned etchings by Alphonse Legros. He had a particular interest in sketches and working drawings, and probably bought them cheaply. A Portrait Study of a Lady sold at Christie's on December 13, 1910, for £4. Some came from the collections of T.R. Way and H.S. Theobald in London. 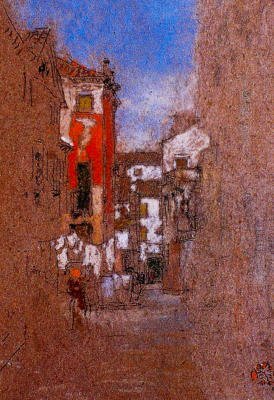 Henry Benedict had several fine Venetian pastels, including Whistler’s Calle San Trovaso. In 1920 loans from Benedict’s print collection were made to an exhibition celebrating the 50th anniversary of the Metropolitan Museum of Art in New York. All this was left to Katharine and Helen to fight over. There had been a major falling out between Helen and her father over Katharine, whom Helen disliked and mistrusted intensely. 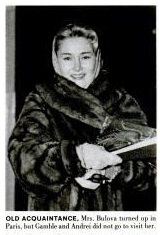 Helen, described by Henry as “hysterical” over the matter, had demanded Henry sign-over a $500,000 trust fund from her inheritance, to “keep her quiet”, before he died. As things transpired, she had very good cause to take such precautions. Eighteen months after Marie’s death, on March 5, 1917, Henry and Katharine (also known as Katherine and Kathleen) married. 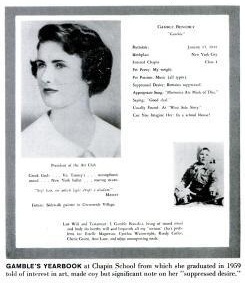 They had the one child, Josephine Catharine Benedict, who was born in Manhattan in June 1918. In January 1938 Josephine married Brattleboro, Vermont, psychiatrist James Douglass Sharpe and had two children, daughter Gamble Benedict Sharpe and son Douglass Geddes Sharpe (born 1939). 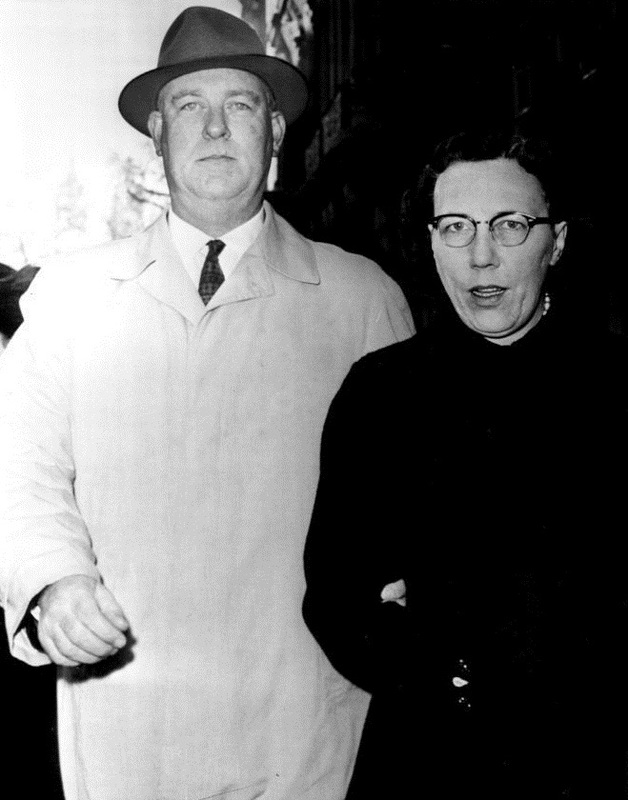 After Josephine’s suicide, on February 9, 1946, Katharine Geddes Benedict fought a long, bitter and controversial court battle against Dr Sharpe to win custody of her two grandchildren. Sharpe would also have no control of their inheritance. In the hearing, Geddes Benedict had accused Sharpe of “killing” her daughter after a quarrel. The two Sharpe youngsters, wards of Geddes Benedict and no doubt growing up to be told this was true, were to adopt the Benedict surname. 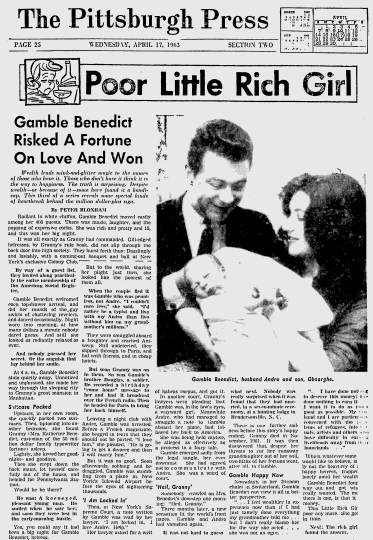 Gamble Benedict Sharpe Gallagher was born in New York on January 15, 1941, and graduated from Chapin School in 1959. Her school yearbook mentioned an interest in art and alluded to “suppressed desires” – if only her school friends knew! At 18, she was a darling of the Southampton summer smart social set, the “junior jet set” as they were called. 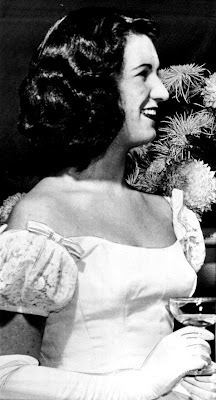 Gambi was the pampered, protected princess at parties at the Meadow Club, where the Benedicts spent much of their summers. Like Katharine Geddes Benedict, other women who had married into considerable wealth summered in Southampton. 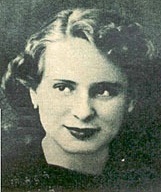 One notable, rather notorious, example was Ileana Maria Pociovalisteanu Kerciu Bulova (later Mrs Auguste Lindt). I mention all this because Ileana Bulova, with a summer home in Southampton, close to the Meadow Club, a live-in Romanian chauffeur, an apartment in Paris and a 20-room chalet in Zurich in which Gambi later stayed, was to play a hitherto unexposed but pivotal role in the Remington typewriter fortune events which were about the unfold in the winter of 1959-60. Ileana not just encouraged but aided and abetted Gamble Benedict all along the way. 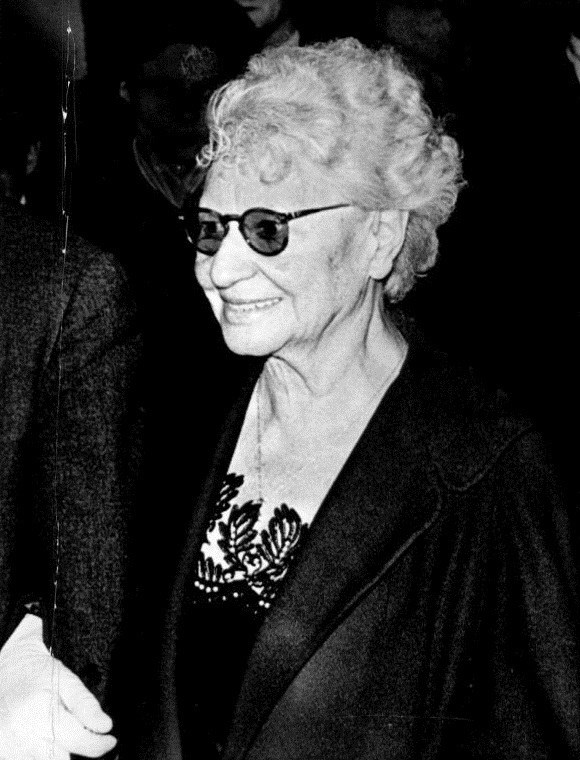 Gambi had been pursued by eligible young bachelors of her own age group, but she yearned to be rescued from the constraints placed upon her by her “Grammie” in the stuffy family home in Manhattan. She had idealistic visions of her prince charming whisking her away from all this, taking her to a rose-covered cottage far away. Andrei Porumbeanu (born January 27, 1925) was charming, and came from far away, but he was no prince. Indeed, he was a genuine pauper. When US newspapers called him Gambi’s “swain”, some felt they’d put an “a” in the middle instead of an “e” at the end. One reporter wrote, “Since nobody can pronounce his name, we call him ‘Poor-No-More’.” Gambi’s brother Doug called him a “miserable cad”, others found “rogue” sufficient. ‘Poor-No-More’ Porumbeanu was Ileana Bulova’s chauffeur, a man of 34 with an Austrian wife, Helma, and a small daughter, Georgette. In the early summer of 1959, while Ileana Bulova was overseas, she lent Porumbeanu the keys to her Southampton home. Porumbeanu saw the chance for some respite from his humdrum, threadbare existence, to experience, albeit briefly, the high life, to throw his own raging parties and rack up the costs on Ileana Bulova’s tab. He would live a big, expensive lie, just for a little while … no real harm would come of it. 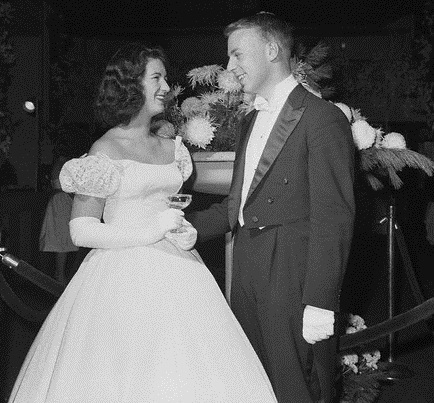 But then in May 1959, at a party given by real estate agent Russell Burke, Porumbeanu met a charming young lady of almost half his age. 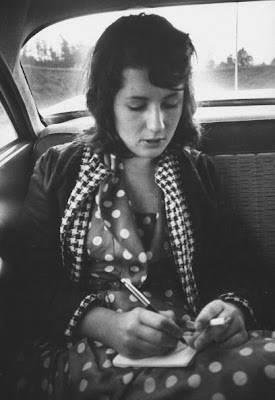 Not alone was Gambi Benedict 18 and attractive, but she was worth many, many millions, she was the typewriter heiress. Porumbeanu reasoned that if he played his cards right, he would be able to live this high life on a more permanent basis. Gambi and Porumbeanu began an affair – Gambi doubtlessly not knowing the truth about her first lover, but being taken in by his lies. 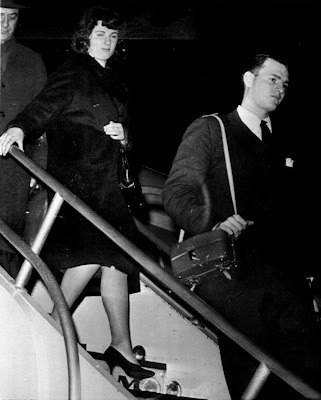 Over the next seven months the pair plotted Gambi’s escape from her gilded cage in Manhattan, from her Grammie, so she could live and study in Europe and marry her prince charming. Gambi cleverly ensured she maintained the pretence of living the life of an 18-year-old heiress. On December 23, 1959, looking radiant, Gambi made her debut at the grandiose Debutante Cotillion and Christmas Ball in the Grand Ballroom of the Waldorf-Astoria. 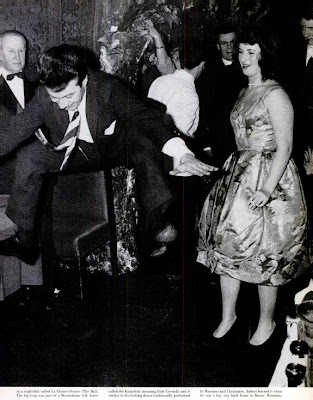 Three days later, she attended a “coming out” tea dance given by Katharine Geddes Benedict at the swish and exclusive Colony Club in Southampton. Through all this, Gambi showed no sign that anything was afoot. As far as the Benedicts could tell, all was well, all was going to plan in Gambi’s life. At four o’clock on the morning of December 27, Gambi woke up, dressed, packed and let herself out of the Manhattan home. She made her way to Pennsylvania Station, where she met Porumbeanu. For four days the pair hid with Porumbeanu’s friends in New York City. On New Year’s Eve, they boarded the Norwegian freighter Edga. On the passenger list, Porumbeanu wishfully described himself as an “economist”. How very drool! After an eight-day crossing, the couple reached Antwerp. 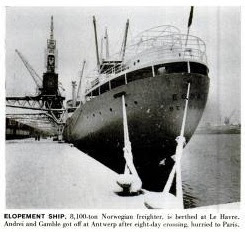 They spent an extra night on board, as the freighter was late and that night’s connecting train for Paris had already gone. They told crew they were to get married in Paris and then carry on to Italy. In Paris they decided against staying with Ileana Bulova – that would have been too obvious – but instead moved in with a friend of Porumbeanu, Jean Cosacesco, a Romanian-born lawyer. Back in New York, alarm bells were ringing. Geddes Benedict had been temporary thrown off guard by a red herring, a false telegram from Mexico. Gambi’s friends were interrogated. There was talk of a “German” companion. Eventually the clues were pieced together, and the trail was uncovered. Katharine Geddes Benedict contacted police on January 3, but fearing a scandal, insisted Gambi not be reported as a missing person. Money had other ways of working these things out. 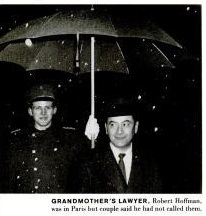 Instead, Grammie put attorney Robert Hoffman on to the case. Gambi, meanwhile, feeling for the first time all the joys of her new-found freedom, was only too willing to talk to the Press. No hiding her light under a bushel, or anywhere else for that matter, for her. She openly talked of studying at the Sorbonne and of using her riches to help "struggling refugees, intellectuals and artists”. 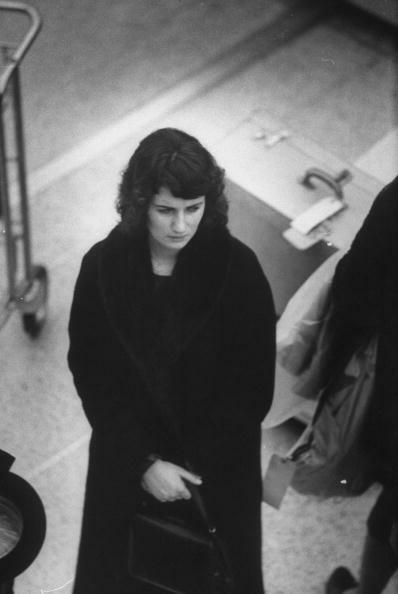 Hoffman flew to Paris and began to follow the lovers. Meanwhile, he made contact with French police and court officials. When he was good and ready, he summonsed Gambi’s brother Doug, then a young private in the US Army, to join him in Paris, and they pounced. 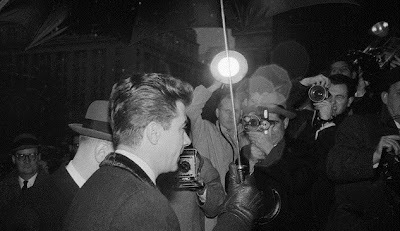 On the night of January 22, 1960, Doug contacted Gambi and arranged a meeting. Gambi and Porumbeanu grabbed a cab outside a nightclub and set off, only to be ambushed by French police. It was a set-up. 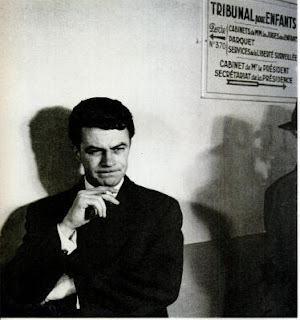 The next morning Gambi was dragged before Judge Pierre Roland-Levy in the Tribunal pour Infants, the juvenile court of the Tribunal de Police de Paris. She was placed into the custody of Doug, to immediately be taken to Orly Airport and flown home with Doug and Hoffman to the US. Porumbeanu wasn’t let near her before she left. 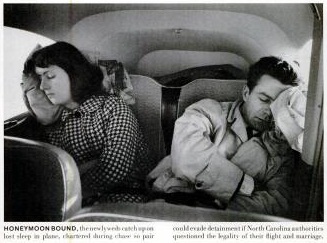 That night Gambi, Doug and Hoffman arrived at Idlewild Airport in Queens on a Pan-Am airliner. Someone had tipped off the Press. Gambi was calm when she landed and went through immigration. But she soon flew into a panic. She screamed to Doug to get her away from the jabbering, bulb-flashing mob. 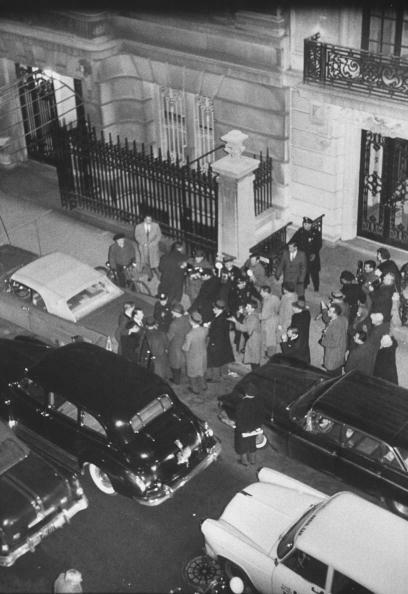 Gambi was rushed out of the airport under police guard and taken back to the Benedicts’ Manhattan home. No one was allowed to see her. 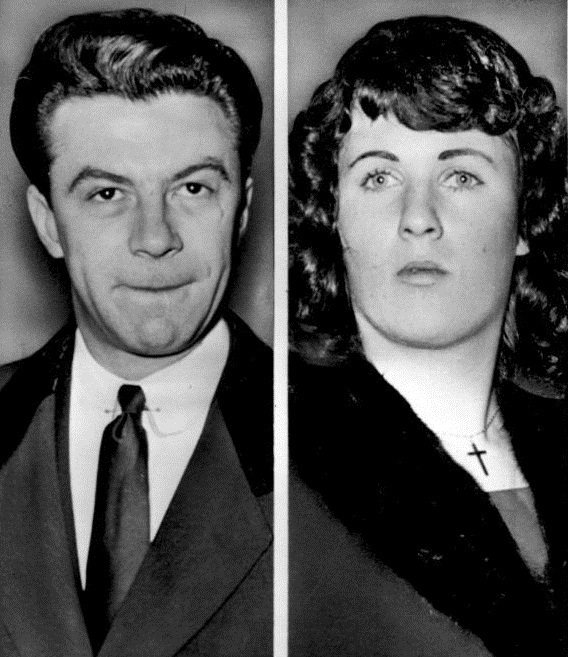 Even her own father, and his new, pregnant wife Marylyn, were turned away from the Benedicts’ front door. Someone was unkind enough to scrawl “Heil, Granny” on the front doorstep. In Gambi’s absence, Katharine Geddes Benedict had found out all she could about Porumbeanu – that he was married, but that he had promised Gambi he would get a divorce and marry her. Grammie acted swiftly. She tracked down Porumbeanu’s wife, Helma (aka “Madi”) and had her and her daughter Georgette (“Gigi”) just “disappear” for a while. Without Helma, Porumbeanu couldn’t get a divorce, even a “quickie” in Mexico, and a heavy spoke would be put in his wheels. But Porumbeanu had managed to follow Gambi back to the US. He soon found his wife and daughter were “missing”. 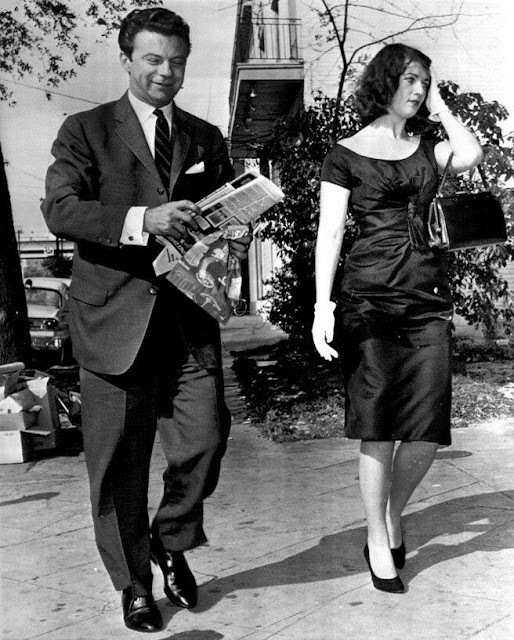 Sensing his chance of a millionaire’s lifestyle was rapidly drifting away, Porumbeanu hired a lawyer and had law clerk Jack Ginsberg try to serve a writ on Katharine Geddes Benedict to “hand over” his wife. 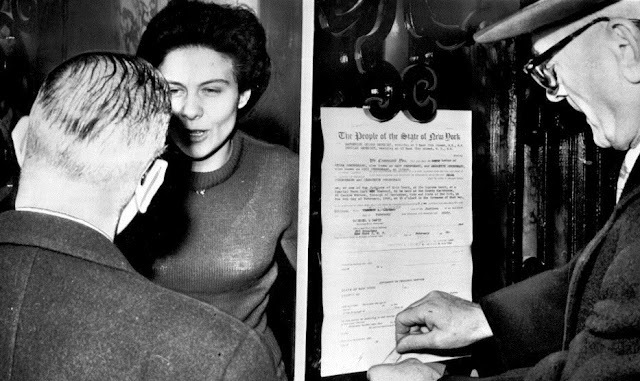 Ginsberg, turned away by a maid, attached the writ to the Benedicts’ front door. On February 2, Porumbeanu told a court Geddes Benedict had “hidden his wife” so she could not consent to a divorce. On January 27, Porumbeanu's 35th birthday, Geddes Benedict petitioned the New York Girls' Term Court, alleging that Gamble’s “conduct has been such as to injure her health, morals and welfare by reason of the fact that she has left the country, has been associating with a married man, father of one child, one Andre Porumbeanu, and has been getting beyond control of the petitioner”. Porumbeanu was there the next day when Gambi was brought before the court, in the New York State Supreme Court building in Manhattan. He no doubt winced when Grammie pronounced him a “penniless refugee” and a “fortune-hunter” (both claims true, as subsequent events would establish). “Gamble doesn’t know what she’s let herself in for,” warned Geddes Benedict. How right she was, on all counts. 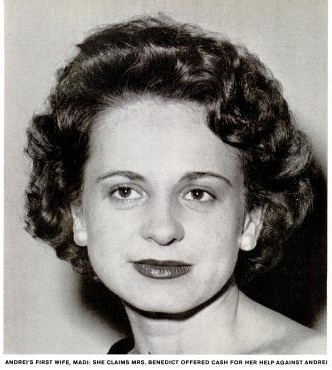 Gambi was made a ward of the court and placed back in the care of Grammie, while the judge weighed up “the moral, social and legal implications” and whether to decree her a wayward minor. She was also ordered not to see Porumbeanu, who, more significantly was ordered to attempt no contact with Gambi. As part of her parole, Gambi was to have mental and physical examinations. The Benedicts took precautions: they moved Gambi into another Benedict house on East No 75th Street, at No 42, where she was watched over by brother Doug. Gambi and Porumbeanu, however, somehow managed to resume their plotting. Gambi had a note smuggled out, scrawled on toilet paper, declaring her ongoing love for Porumbeanu and saying she was being held captive by Doug. Porumbeanu had acted quickly. Though down to his last $10, he had borrowed money from a Romanian political scientist, Cornel Pope. 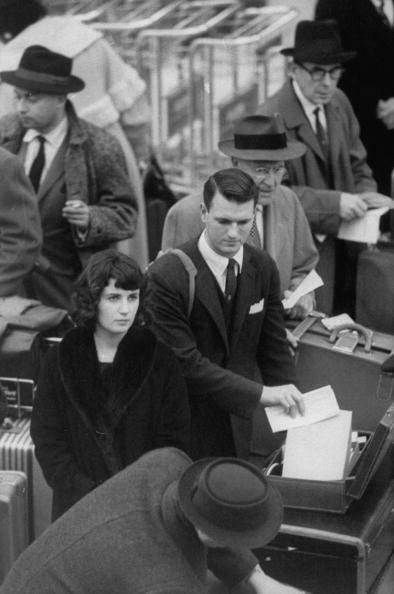 Porumbeanu and Gambi took a train to Wilmington, Delaware, then a plane to Raleigh, North Carolina, hoping to throw Katharine Geddes Benedict and Robert Hoffman off their trail. In Raleigh, the pair find the Press are already on to them and, told to wait a day for a marriage licence, decide to move on. They rented a car and headed to Hendersonville, North Carolina. There they had blood tests hurriedly done and got a marriage licence from county register of deeds Marshall Watterson. 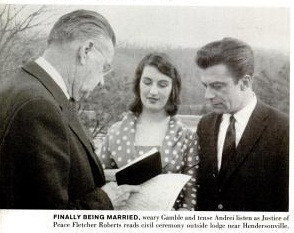 That night of April 6, in a single-ring 10-minute ceremony on the lawn outside a mountain hunting lodge eight miles from town, owned by county attorney Arthur J.Redden, Redden “gave the bride away” and Justice of the Peace Fletcher Roberts declared the two legally “man and wife”. It was a simple, straightforward service, but it wasn’t legal at all. Porumbeanu had convinced Redden, Watterson, Roberts, Gambi and others that just six days earlier he had been granted a divorce from Helma in Mexico. 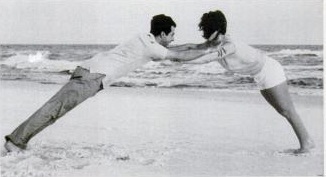 Much later, after the rose tinting had fallen from Gambi’s glasses, she learned that he was not legally divorced. Helma had not resided in Mexico and had not consented to the divorce. Porumbeanu, overcome by his greed, had allowed himself to become a bigamist. 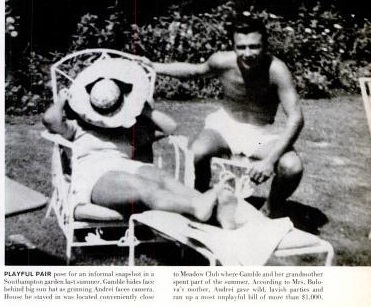 June 30, 1960: Gambi and Porumbeanu seek to “vacate the warrants of arrest” against them “on the grounds that they had been married …that she is now emancipated; and that they are both happily married and reside in Montclair, New Jersey”. In July their application is rejected and the arrest warrants stay in place. February 24, 1961: Helen Benedict Forrest sues Katharine Geddes Benedict for fraud, claiming Geddes Benedict had concealed Henry H.Benedict’s will when he died in 1935. 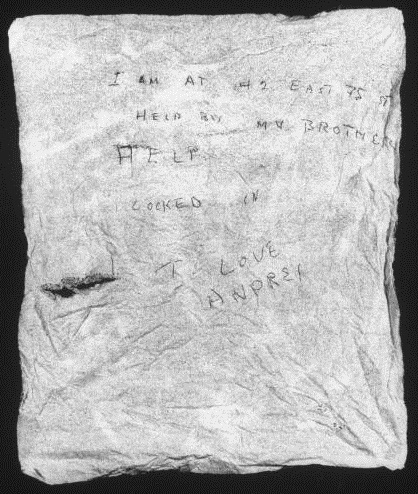 Forrest also claimed Geddes Benedict had “estranged” Henry from his family and friends. “It was inconceivable he would not have left a will providing for his family, inconceivable that he would have bestowed his entire fortune on his second wife,” Forrest said. Forrest said she had been lulled by Geddes Benedict into believing Henry had died leaving no assets, but had discovered otherwise during the Gambi business. 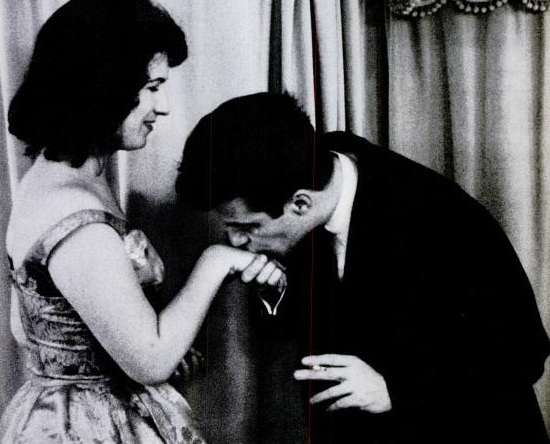 April 2, 1961: Gambi gives birth to her first son, Gheorghe Mihail, in a community hospital in Montclair, New Jersey. The couple cannot return to New York while contempt of court charges are proceeding. 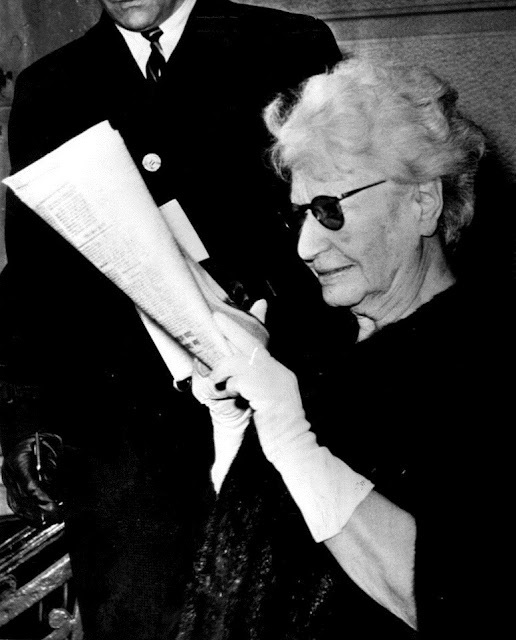 April 20, 1961: Two months after opening fraud proceedings against Katharine Geddes Benedict, Henry Benedict’s eldest daughter, Helen Elizabeth Benedict Forrest dies, aged 81. 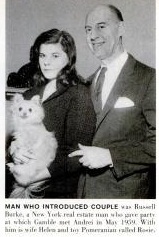 August 29, 1961: Gambi begins legal action to remove Katharine Geddes Benedict as her legal guardian. October 29, 1961: Katharine Geddes Benedict dies, aged 76, at her home “of natural causes”. Gambi and her brother Doug will eventually each be bequeathed $20 million. That equated to two-fifths of the estate each. US Tax investigators find almost $2 million in cash and jewelry stashed in Geddes Benedict’s home. November 17, 1961: Porumbeanu is found to be in criminal contempt of court for violating court orders not to associate with Gambi. 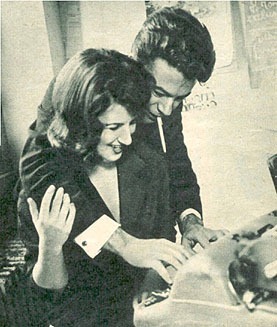 January 5, 1962: Gambi and her brother Doug seek to be allowed to receive a share of the accrued income from the Remington typewriter fortune. 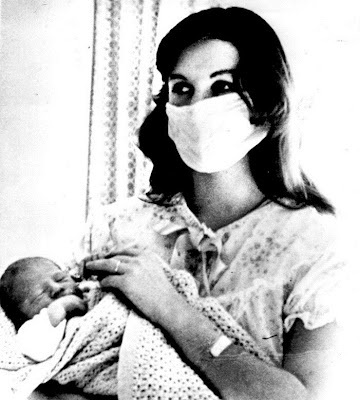 January 1963: Gambi’s second son, Grigoreo (Gregoire), is born. September 18, 1963: Gambi announces she is ending her “marriage” to Porumbeanu. 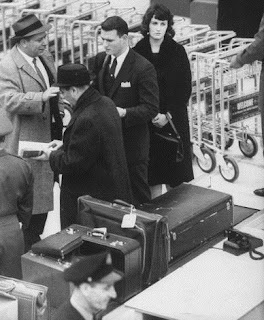 September 18, 1963: Gambi and her two sons leave Rome and go into hiding in Zurich to avoid Porumbeanu, who she is suing for “misconduct”. Gambi had also cancelled Porumbeanu’s power of attorney over her income from her $20 million inheritance trust fund. 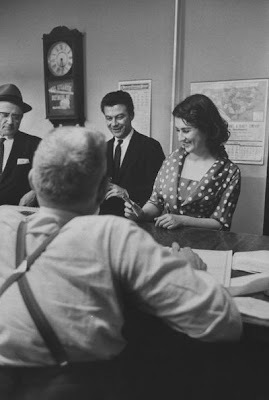 She labelled Porumbeanu a “fortune hunter” and claimed he had already squandered $500,000 of the Remington typewriter inheritance. 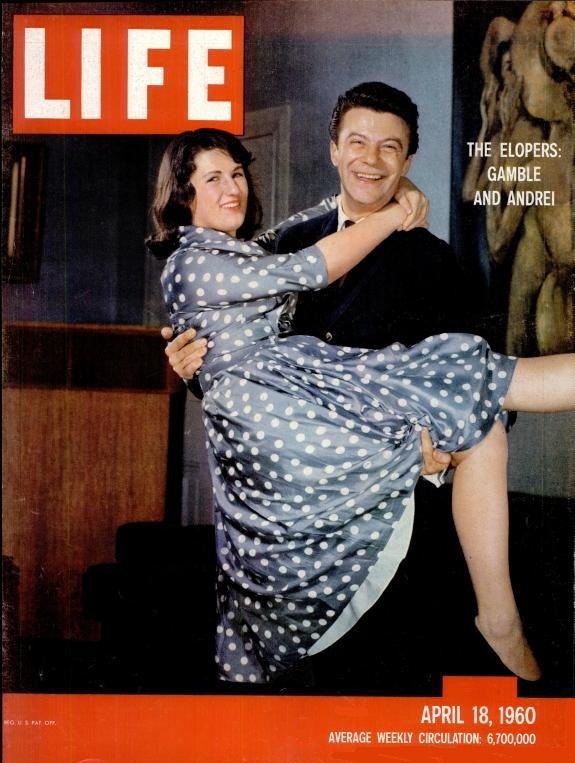 October 7, 1964: Gambi is granted an annulment on the grounds she was never legally married. Porumbeanu’s real wife Helma and their daughter Georgette attend the hearing to support Gambi. Gambi says Porumbeanu was a “leech, a letch and a drunk”. He is described as an “unfit human, an unfit father”. It is alleged he was constantly drunk, that he got a 17-year-old maid pregnant and forced her to have an abortion, and that he tried to invade the rooms of Gambi’s visiting female friends. 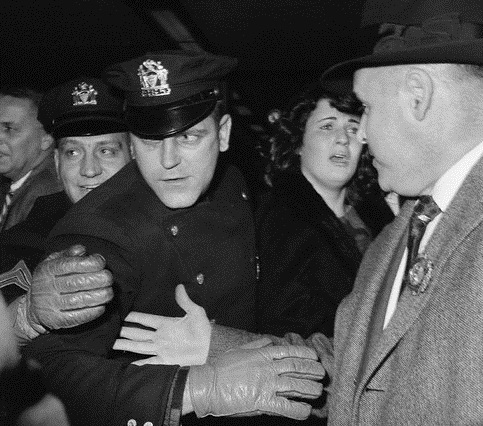 July 1, 1965: Gambi, 24, marries $11,500-a-year New York policeman Thomas F. Gallagher, 32, in Clinton. Gallagher, born in Auburn the son of a former Major League baseballer, Thomas Gallagher, is a state police investigator. They are to honeymoon in Ireland. The best man at their wedding is Gambi’s brother Doug, who introduced the couple. The maid of honour is Doug’s future wife, Sammy Jane Dowling, from Fort Worth, Texas. Doug and Sammy divorced in 1984. April 22, 1966: Tom Gallagher settles a $1 million Supreme Court action against the Hearst Corporation for publishing a rumour that his marriage was in trouble. 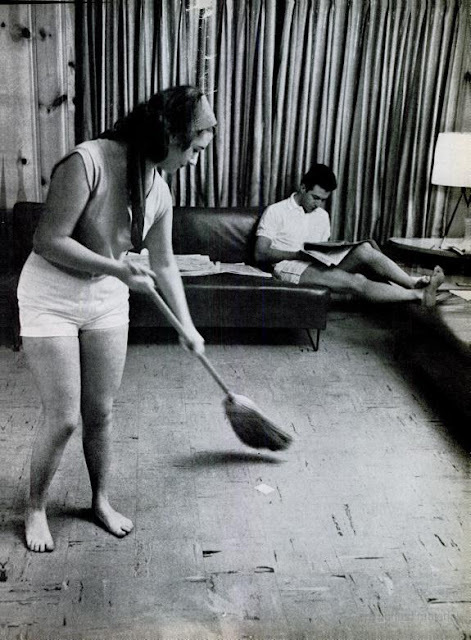 A retraction, headed "Gamble is a Happy Wife" was published in the New York Journal-American. It said, "Gamble Benedict Gallagher, from every report, is enjoying happy married life with her State Police Investigator husband, Thomas F.Gallagher and their two boys by Mrs Gallagher's former marriage. Last December. Gamble became a Roman Catholic and regularly attends Mass with her family." The retraction was given the same prominence as the original story, headlined "What Now, Gamble? ", published the previous October. In that article it was stated that Gambi "is back with her lawyers for a change". 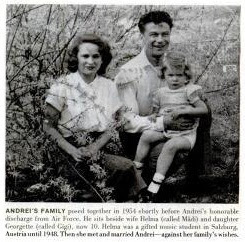 It also said that she and her husband "have been squabbling ..."
July 11, 1967: Gambi gives birth to a third son, Grant, in Utica. 1972: Porumbeanu sues American Express for $50,000 for allowing Gambi to open 19 packages of his belongings sent from Rome at the time of their 1963 separation. August 9, 1974: Gambi is living in Barneveld, New York, with husband Tom and their sons Grant, 7, and Courtney, 4, as well as her two sons from her first “marriage”, now known as George and Gregory. 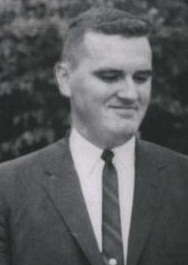 Gallagher retires from the police force, aged 41, to become a teacher at the Valley Forge Military Academy in Wayne, Pennsylvania. 1985: In late 1985 Chief Thomas F.Gallagher was Pennsylvania's top criminal investigator. He was director of the Bureau of Criminal Investigation in the State Attorney General's office, having formerly been head of the Criminal Justice department at Valley Forge Military Academy and Junior College. Gallagher had lectured at INTERPOL conferences and served as a security consultant to the Winter Olympic Games in Sarajevo in 1984. September 23, 1988: Andrei Porumbeanu dies in New York. aged 63. 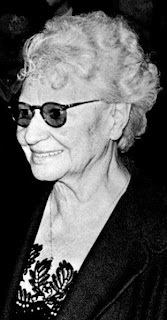 Sometime between August 1974 and January 1999: According to the National Society Magna Charta Dames and Somerset Chapter Magna Charta Barons, as at January 8, 1999, one of its members, “Mrs Thomas F.Gallagher (Gamble Benedict Sharpe)”, was deceased. Gambi would be 71 now if this was untrue. 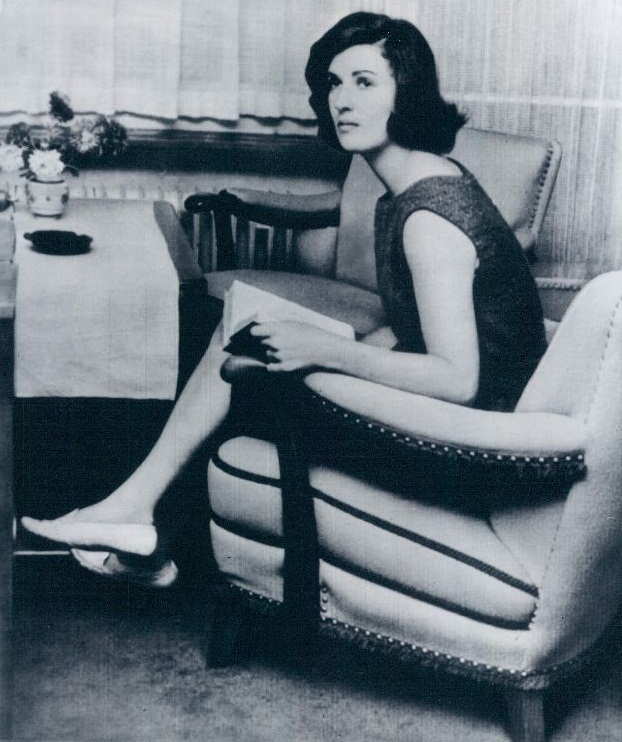 August 6, 2009: Ileana Bulova-Lindt dies in West Palm Beach, Florida, aged 89. Blick 4 Found in Philadelphia Attic! Oh Lucky Typewriter Collecting Day!